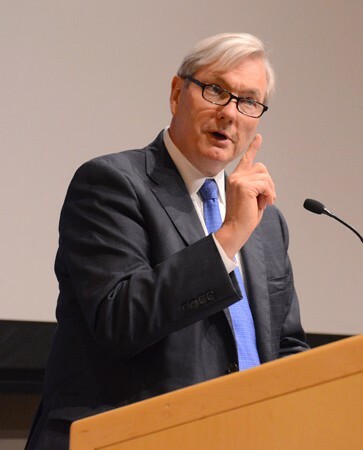 The swiftly moving Ebola epidemic presents an immense challenge to unprepared national and global health systems, infectious disease expert Michael Osterholm said at an Ebola symposium Tuesday at the Johns Hopkins Bloomberg School of Public Health. In addition to Osterholm’s keynote, the symposium included five presentations and two multidisciplinary panels and featured experts in microbiology, public health, bioethics, and emergency medicine. Topics discussed included a lack of coordination and leadership at the global level, an overview of experimental medical counter measures for Ebola, and the complex ethical decisions that need to be made in real-time. Speakers acknowledged severe shortages in the affected countries—Liberia, Guinea, and Sierra Leone—of trained healthcare workers and vital supplies (including gloves and masks) because of a frustrating lack of logistical support. Ebola was discovered in 1976 in central Africa, and past outbreaks have been contained, but the current outbreak has seen the disease move for the first time ever from remote areas into urban centers. Osterholm cautioned that the epidemic could become more widespread as seasonal workers move east from the affected regions into more populous parts of the continent—such as Kinshasa, capital of the Democratic Republic of Congo and home to more than nine million people. At this stage in the epidemic, Osterholm said, the Ebola virus has the upper hand and the global health community is playing catch-up. “The virus is operating on virus time and the rest of us are operating on bureaucracy and program time, and the virus is winning hands down,” Osterholm told an audience of 350 in Sommer Hall and more than 2,500 following the live webcast. Johns Hopkins University President Ronald J. Daniels, who joined School of Public Health Dean Michael J. Klag in kicking off the symposium, noted that throughout its history, Johns Hopkins has been a leader in helping the world better understand public health crises—from the 1919 flu epidemic to polio to smallpox to HIV/AIDS—and shaping effective responses. “Now,” Daniels said, “as the numbers of reported Ebola cases mount and the death toll rises; as nations and communities across West Africa struggle to meet the basic health care needs of populations in addition to managing acute care for Ebola patients; as we consider the daunting implications for the global populations if this outbreak is not met with an effective and sustainable international response; we are acutely aware of Hopkins’ obligation to marshal our intellectual bounty as the world community wrestles with this unpredictable and growing epidemic. Trish Perl, a professor of medicine and infectious diseases at the Johns Hopkins schools of Medicine and Public Health, said there are relatively simple things that can be done now to decrease mortality in West Africa. Data suggest aggressive intravenous hydration, replacing electrolytes, and managing nausea and fever are relatively inexpensive measures that can be part of the bundle of care. The half-day symposium was organized by Andrew Pekosz, an associate professor in molecular microbiology and immunology and a leading expert on the basic biology of influenza and other emerging virus infections. An archived version of the event (in two parts) can be viewed below. A full agenda can be viewed online.